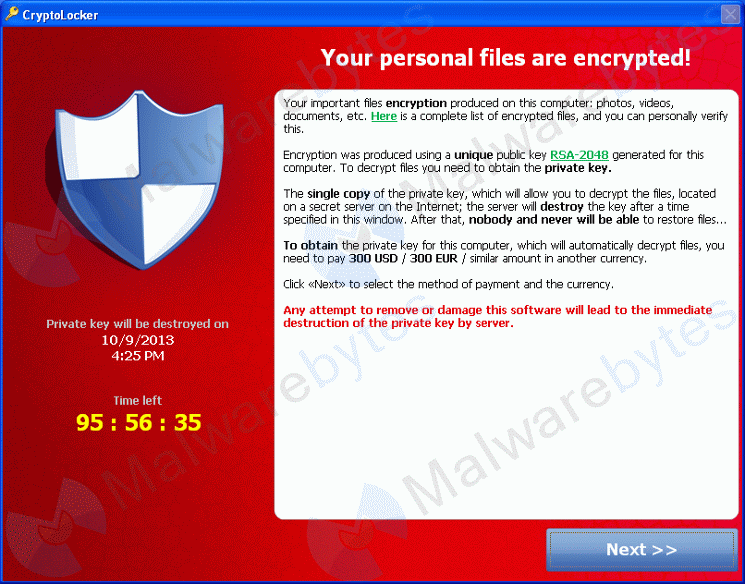 The Malwarebytes research team has determined that Cryptolocker is Ransomware. This type of malware denies the user access to his files or the normal use of his computer. They demand payment to restore the computer to the state it was in before the infection. How did Cryptolocker get on my computer? Ransomware uses different methods for spreading themselves. This particular one was sent as an attachment in a fake email from a courier-service. The infection is also spread by websites. How do I remove Cryptolocker? Our program Malwarebytes' Anti-Malware can detect and remove this ramsomware. Is there anything else I need to do to get rid of Cryptolocker? Malwarebytes' Anti-Malware removes Cryptolocker completely, but it can not undo the encryption. There are a few things you can try. Read this post at Bleeping Computer where "Grinler" describes a method using Shadow Volume Copies. Basically you will need to have some form of backup to retrieve the files. As you can see below the full version of Malwarebytes' Anti-Malware would have protected you against Cryptolocker. It would have warned you before the ransomware could install itself, giving you a chance to stop it before it became too late.